[126 Pages Report] The global kidney/renal function test market was valued at USD 558.3 Million in 2016 and expected to reach USD 790.1 Million by 2022, growing at a CAGR of 6.1% during the forecast period. 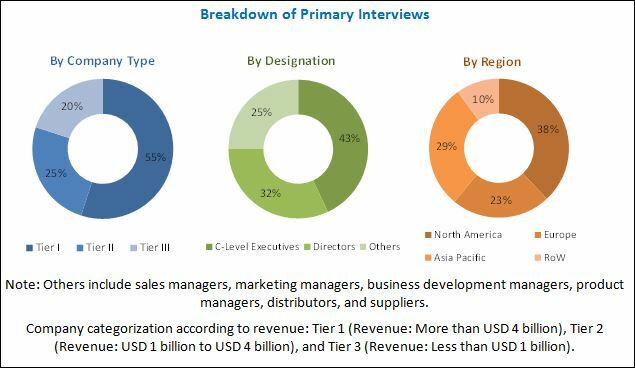 Growth in the kidney function test market can primarily be attributed to factors such as the rising prevalence of kidney disease, growing prevalence of diabetes and hypertension, rapid growth in the geriatric population, and the rise in alcohol consumption are driving the growth of the market. To track and analyze competitive developments such as expansions, product launches, agreements, acquisitions, and regulatory approvals. In 2017, the key players in the global kidney function/renal function test market are Beckman Coulter (US), Siemens (Germany), Nova Biomedical (US), Roche (Switzerland), Abbott (US), URIT Medical (China), ARKRAY (Japan), OPTI Medical (US), ACON Laboratories (US), Sysmex (Japan), 77 Elektronika (Hungary), and Randox Laboratories (UK). The global kidney function tests market is expected to reach USD 790.1 Million by 2022 from USD 586.5 Million in 2017 at a CAGR of 6.1%. Growth in the kidney function test market can primarily be attributed to factors such as the rising prevalence of kidney disease, growing prevalence of diabetes and hypertension, and the rise in alcohol consumption are driving the growth of the market. Based on product, the market is categorized into dipsticks, reagents, and disposables. The dipsticks segment is expected to account for the largest share of the market in 2017 and is also estimated to grow at the highest CAGR during the forecast period. Factors contributing to the large share of the market include the cost-effectiveness of dipstick testing, which also accounts for its widespread application across the globe. Based on type, the market is segmented into urine tests and blood tests. Urine tests are further categorized into urine protein, creatinine clearance, and microalbumin tests. Similarly, blood tests are categorized into serum creatinine, glomerular filtration rate (GFR), and blood urea nitrogen (BUN) tests. The urine tests segment is expected to hold the largest share of the market in 2017. This segment is also expected to grow at the highest CAGR during the forecast period. The large share and high growth rate of the urine test segment can be attributed to the increasing usage of urine dipsticks analysis, the ease in sample collection compared to blood tests that can cause discomfort and swelling, and very low risk of infection due to sample collection. On the basis of end users, the market is segmented into hospitals, diagnostics laboratory, and research laboratories & institutes. The hospitals segment is the largest and fastest growing segment of the market. Factors contributing to the large share and high growth rate of this segment include the increasing number of awareness campaigns about kidney function tests and the growing focus of emerging economies on increasing the number of hospitals in these regions. In 2017, North America is estimated to account for the largest share of the market, followed by Europe. This large share can be attributed to factors such as the increasing incidence of chronic diseases, rising prevalence of hypertension, growing incidence of diabetes in the US, and increasing initiatives by the Canadian government for the awareness and treatment of kidney diseases. However, the Asia Pacific region is expected to register the highest CAGR during the forecast period. 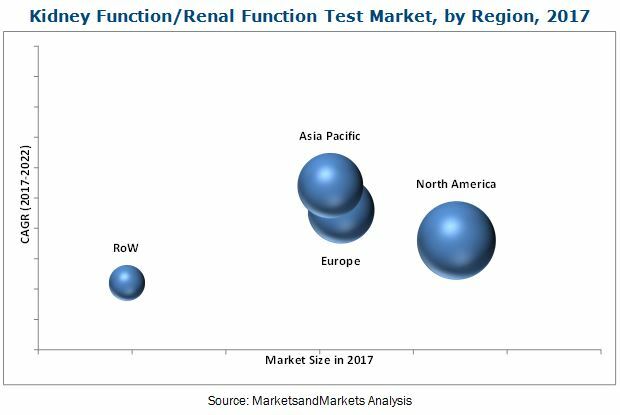 The prominent players in the global kidney function/renal function test market are Siemens (Germany), Beckman Coulter (US), Sysmex (Japan), Roche (Switzerland), Abbott(US), Nova Biomedical (US), URIT Medical (China), ARKRAY (Japan), OPTI Medical (US), ACON Laboratories (US), 77 Elektronika (Hungary), and Randox Laboratories (UK).